Gilbert was Henry and Esther Jane James Leggroan’s fourth child and second son. He was born in 1898 and lived on the family farm in Mill Creek in the Salt Lake Valley. He must have had a heart defect present at birth, because he died in 1907 as a young child of “heart dropsy.”  The modern diagnosis might have been a mitral valve defect. His maternal aunt, Nettie James Leggroan, died while pregnant from mitral valve prolapse. Bankhead, Henrietta Leggroan. Oral interview by Florence [Leggroan] Lawrence. Salt Lake City Utah, 1977. Transcript. Helen Zeese Papanikolas Papers,1954-2001. Ms0471. Box 2, folder 3. Special Collections. J. Willard Marriott Library. University of Utah, Salt Lake City. Church of Jesus Christ of Latter-day Saints, Record of Members Collection. Wilford Ward. CR 375 8, box 7641, folder 1, image 94. Church History Library, Salt Lake City, Utah. Utah State Board of Health, Bureau of Vital Statistics. Certificate of Death. Leggroan, Gilbert. File No. 512. Utah State Archives. Salt Lake City, Utah. Utah Bureau of Vital Statistics. Utah Death Index, 1847-1966. Leggroan, Gilbert. File No. 1907001278. Utah State Archives. Satl Lake City, Utah. United States, 1900 Census, Utah, Salt Lake County, Mill Creek. 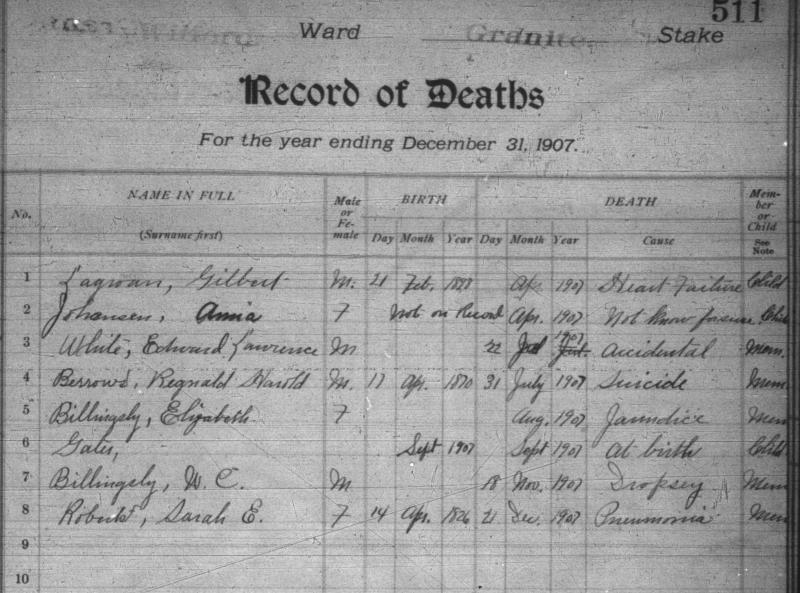 This census lists Gilbert’s birth year as 1900, but his death records list it as 1898. Utah State Board of Health, Bureau of Vital Statistics, Certificate of Death, Gilbert Leggroan, File No. 512, Utah State Archives, Salt Lake City, Utah. Church of Jesus Christ of Latter-day Saints, Record of Members Collection, Wilford Ward, CR 375 8, box 7641, folder 1, image 94, Church History Library, Salt Lake City, Utah.